Every month at the library we hold a book discussion. My boss and I split them so I do six and year and she does six a year. The four I have done so far this year have not been winners. This last book I picked was so unliked I was actually surprised. I liked it. But maybe my standards are lower. I'm not sure. All I know is that the dislike for this book was so overwhelming and here I thought I was picking an inspirational harmless book. I'll know better next time. On a positive note the dessert I made was well received. Usually the treats I make are well received. It's just the books I pick out that aren't. I'm making them pick out the books to be discussed for next year. If they don't like them It won't be my fault. 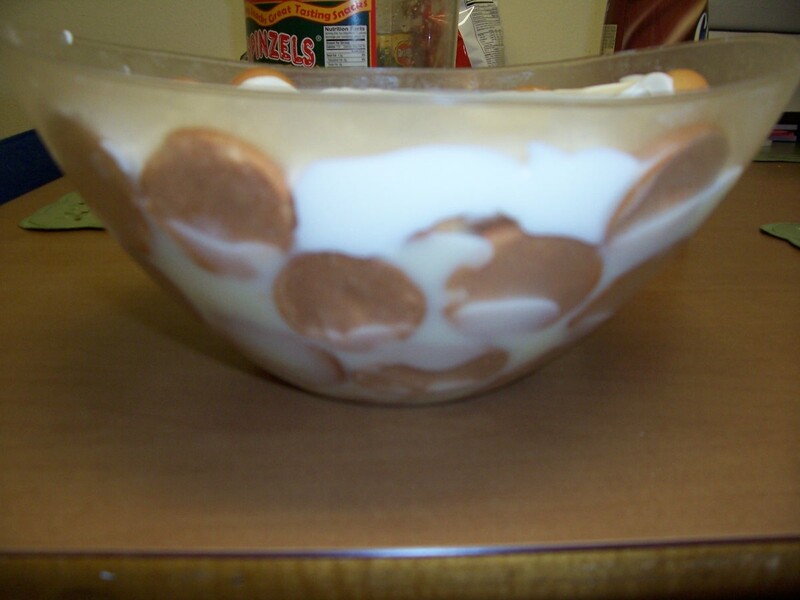 I have had banana pudding many times but never like this. This was homemade and so good. Really it was very easy to make. The pudding just took some time to cook and thicken up. Other than that it was super easy. You should check out the blog I snagged this recipe from and the idea of putting it cute little mason jars. This woman's blog is awesome, A Cozy Kitchen. I doubled the recipe and was able to assemble six pint size mason jars plus a mediumish size bowl. This is very sweet so pint size servings might be too much. I had plates set out for those who didn't want a whole mason jar so they could scoop out what they wanted. The 1/2 pint mason jars would probably be better. Add milk and egg yolks to a medium saucepan and whisk. Add sugar, flour, and salt and whisk until smooth. Cook over medium heat, stirring constantly, 20 minutes or until thickened. If it’s not getting as thick as you’d like after 20 minutes, feel free to add another teaspoon of flour. Mine didn't get think enough after 20 minutes so I added another 2 tablespoons of flour and let it cook for another half hour. Remove from heat; stir in the vanilla. For the whipped cream: Pour the heavy cream into a mixing bowl (I used my Kitchenaide mixer) and beat until foamy. Gradually add powder sugar to mixture, beating until soft peaks form. I used 1/2 pound of powder sugar. I let my Kitchenaide keep beating it until it became a whipped cream. 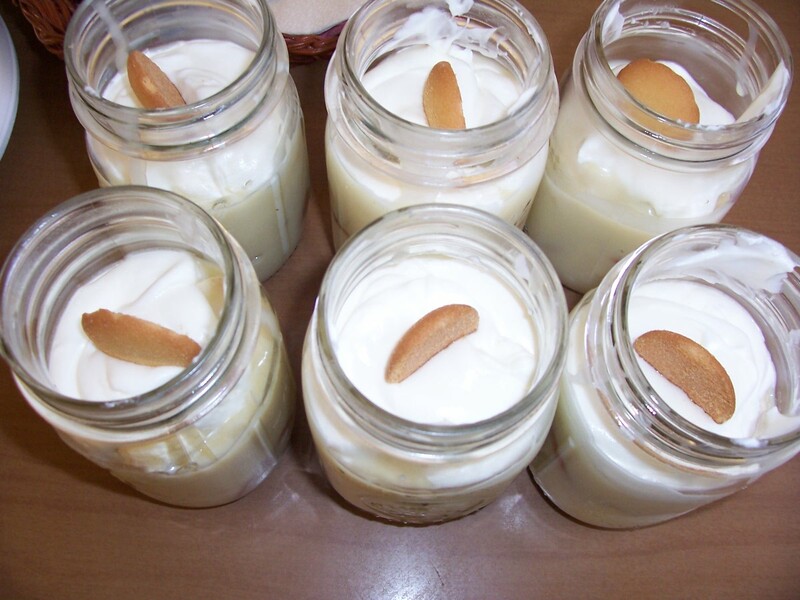 You can arrange in a big bowl or small mason jars. For either, arrange vanilla wafers in bottom of a small serving dish (or mason jar). Slice 1/2 banana and layer over wafers. 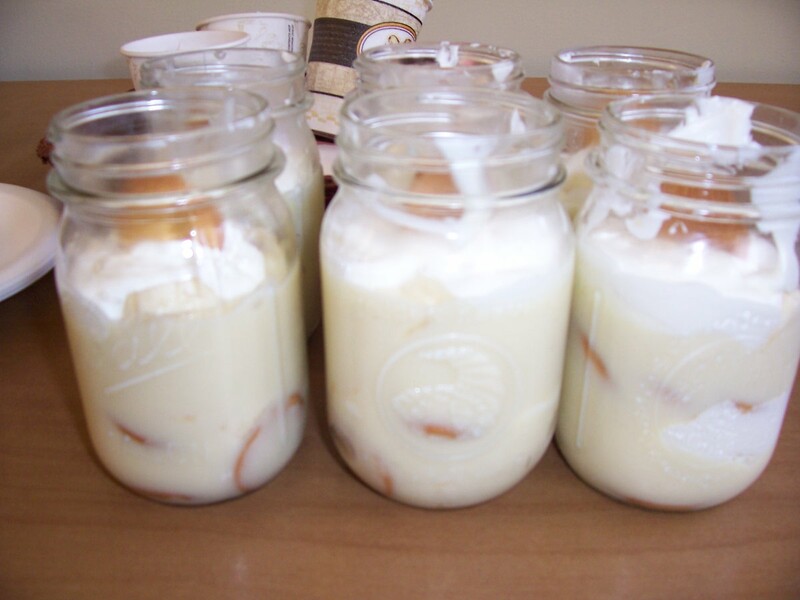 Spoon custard over bananas. Spoon whipped cream over custard. Repeat until custard is gone and you have a few solid layers. I didn't use all the whipped cream I made. Serve immediately or cover and chill for eight hours.